The project calls for a convenience store, a coffee shop or deli, professional office space, community meeting space and a tourist information bureau. SOUTH PORTLAND — A Topsham development company has submitted a proposal to convert the former National Guard armory into a multi-use property anchored by an Irving gas station and convenience store. Priority Real Estate Group is seeking a conditional use zoning amendment to redevelop the high-profile, often-vacant building at the foot of the Casco Bay Bridge into a service center and gathering place for motorists, cyclists and pedestrians. 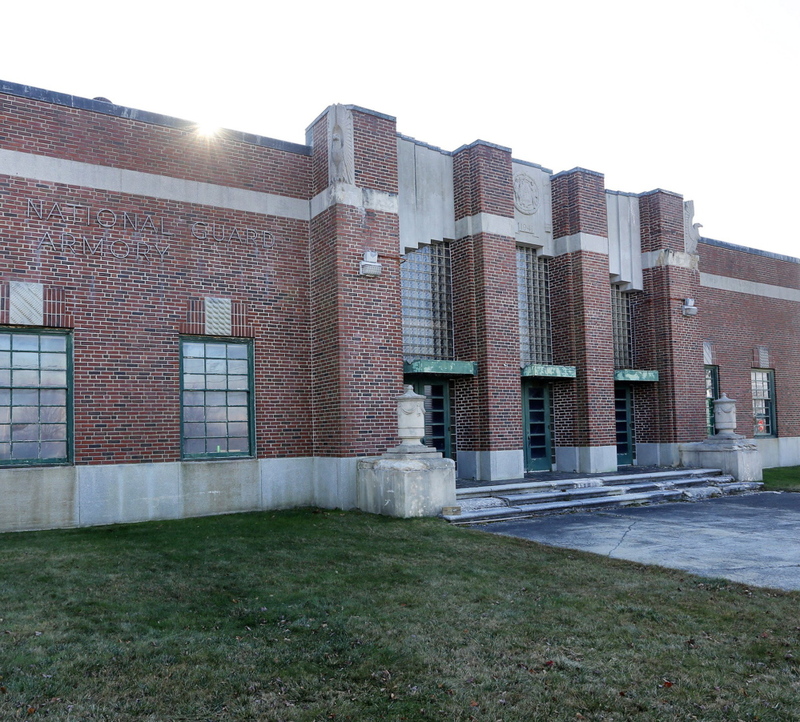 City leaders agreed to sell the armory to Priority a little more than two months ago. The $2.5 million project would preserve the art deco-style front section of the brick building at 682 Broadway. In addition to a convenience store, it would contain a coffee shop or deli, professional office space, community meeting space and a tourist information bureau. A five-pump fueling station, a bicycle maintenance station and 72 parking spaces would be behind the two-story building, while a gazebo and public art pieces would be featured on the side and front lawns. Howard said Priority has been interested in redeveloping the armory for five or six years. “We were just trying to figure out what we could do with it,” he said Monday. Priority applied last week for a conditional use zoning amendment, which is scheduled for a Planning Board workshop on Feb. 10 and a public hearing on Feb. 24, followed by a City Council workshop and vote, said Community Planner Stephen Puleo. The 2.3-acre parcel is next to the city’s central fire and police stations, and is wedged between a residential zone and a limited business zone. If the zoning amendment is approved, Priority could be back before the Planning Board for site plan review as early as mid-May. 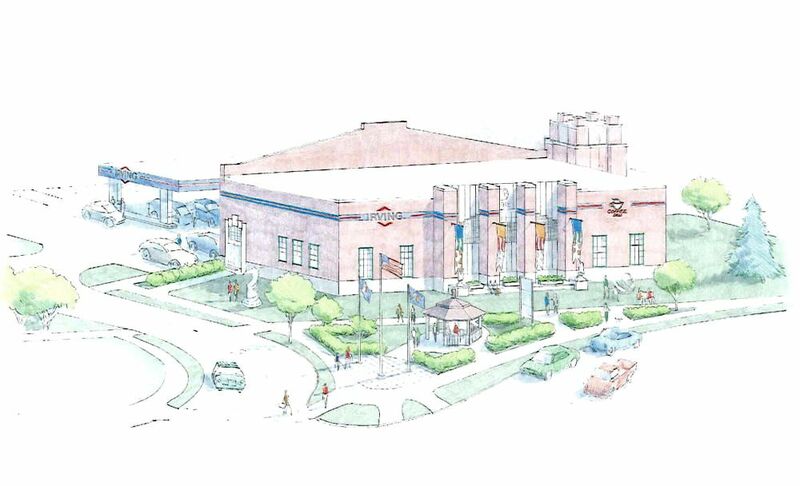 City Manager Jim Gailey signed a contract in November to sell the former armory to Priority for $700,000, which is $50,000 more than the city paid for it eight years ago. Initially, Priority’s plan got mixed reviews. Some people praised the city’s efforts to preserve a local landmark and said the Mill Creek shopping area needs a gas station. Others worried about potential traffic impacts at an already busy intersection and questioned whether the armory deserved a more imaginative proposal. Built in 1941, the now run-down and neglected armory was listed among several important “Places in Peril” by Greater Portland Landmarks in 2012. The 37,000-square-foot building includes a newer military drill hall and garage space that Priority plans to tear down. Any architecturally significant features would be preserved, including large military-themed medallions on the building’s exterior. Any vehicle traffic generated by the convenience center likely would be mitigated by signal improvements that are planned for the intersection where the bridge meets Broadway, Puleo said. Traffic would access the armory property via Armory Street, which would allow both left- and right-turning traffic, and Hanson Street, which would allow only right-turning traffic. Howard compared the armory proposal to Rusty’s Market, a Shell gas station and convenience store that Priority built and operates on Route 24 in Topsham. Priority located the store near the road and put the gas pumps and parking spaces behind it, along with a gazebo, a farmstand for local growers and a bicycle maintenance station for cyclists who use a recreation path to the rear of the property. The Maine Association of Planners named Rusty’s Market its 2013 Project of the Year because Priority worked cooperatively with town officials and neighbors to develop ordinance amendments and create a community gathering place. Howard said Priority is taking a similar approach with the armory project. It’s lining up a local firm to lease a majority of second-floor office space and plans to allow local nonprofits to use excess space for meetings and other activities. Priority also plans to lease the cafe or deli space to a local company and to set aside first-floor space where the city or chamber of commerce can operate a visitors center.